I know this isn’t a “real” recipe but I saw the idea on Pinterest and I had to try it. We spend so much of our lives trying to get Evan to eat. He isn’t very picky but he eats like a bird. It drives Dewey and I NUTS. Sunday Dewey took Will and Nicole skiing so Evan and I had a Mommy & Evan day. We were heading to the zoo so I wanted to feed him something before we left. Peanut butter and jelly sandwiches are one of his favorites (ish) but we still have to cajole him to eat it. 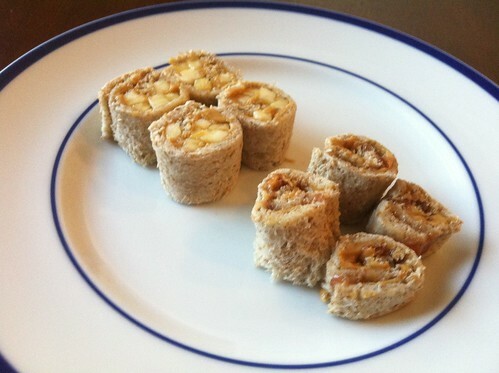 Enter the peanut butter and banana sushi! First take two slices of bread and cut the crusts off. Use a rolling pin to roll the bread flat (you have to do this or it will fall apart)! Spread the entire slice with peanut butter (or the nut butter of your choice). 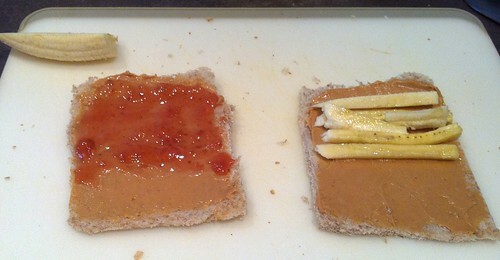 Either spread 2/3 with jam or add pencil sized pieces of banana. I then drizzled the banana one with a bit of agave nectar. Roll it up and slice it. I found that it cut much better if you sawed back and forth with the knife instead of trying to go through in one slice. The banana ones look MUCH better than the jam ones. Evan thought the idea of peanut butter and banana was the GROSSEST ever but I convinced him to try one. Soon there was nothing left but crumbs. 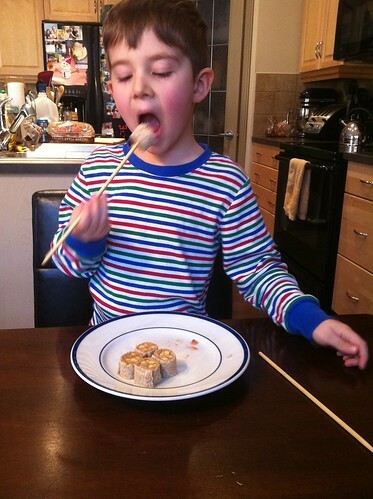 Oh…and don’t forget to let them use chopsticks! Forget it! I’ll just use the ol’ “stab it” method! Such a quick and easy way to make lunch fun. What are your favorite preschool friendly lunch ideas? I love this! I am so making these for my kids. I have not made it yet but I will be also doing this. I used to make a similar after school snack for my nanny kids. They called them PBTBs: Peanut butter and banana tortillas. It’s basically the same idea as the recipe you posted, except you use a tortilla in place of the bread. Eliminates the need for a rolling pin! They were a huge hit. We made those too. I might try using a tortillas next time. UGH..my kids eat like a bird too, it’s sooooo annoying. Every night at dinner it’s a fight to get them to eat! These look good, I’ll be trying it with my boys! Glad I don’t have the only bird children. Fun! I was just looking for cool lunch ideas for my youngest who is committed to eating mac & cheese every day for the rest of his natural life! He’s allergic to peanuts, but maybe just jelly and bananas?! That is a great idea! 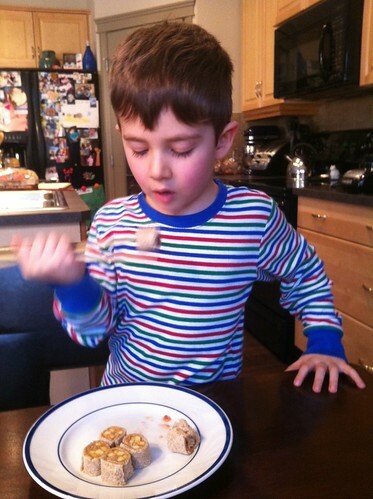 Our kids like tortillas spread with peanut butter, drizzled with honey, and have some oats sprinkled on top. Roll it up and slice or just eat like a burrito! Easy breakfast or after school snack! Actually, anything with peanut butter is a win in our house! looking, decided on the perfect home in Charleston, SC. are hibernating, try not to disturb them.